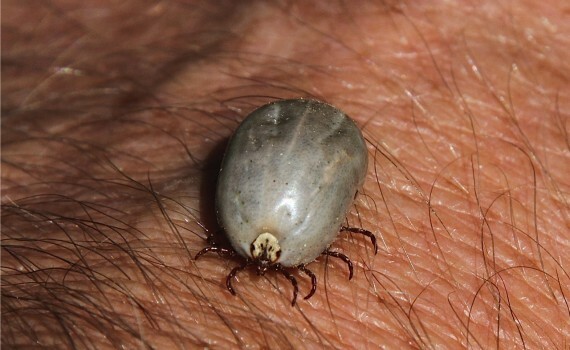 Most ticks require a blood meal for each developmental stage. They will insert a barbed mouthpart into the skin and “cement” their mouthparts to the surface where they will feed for several days. They can serve as vectors for several disease organisms. The following information will help you reduce tick habitats. Larvae and nymphs will feed on small animals up to 2 weeks until they are engorged. At that point, they will drop off the host and molt. The adults will feed on larger animals which include humans. Females will lay up to 6,000 eggs. Ticks are attracted to animal scents and therefore will be located along roads, paths, and trails. Adults will crawl up weedy vegetation, cling to it and wave their legs to grasp onto any passing host. They are most abundant in June and July. The brown dog tick feeds almost exclusively on dogs and can complete its life cycle indoors unlike most other ticks. Cut grass and trim vegetation regularly. Keep pets within the mowed areas. Keep items away from the property that may attract rodents and wildlife, such as bird feeders, acorns, berries, woodpiles, decks in poor repair, etc. If property is up against a wooded area, create a 1-foot barrier with gravel along the property line to create a ?safe zone?. Keep pants legs tucked into shoes, button and tuck in shirts, and wear long sleeves when traveling in wooded areas. Apply DEET according to label instructions. Continue to check children and pets for ticks especially around the neck and head. If a tick is attached to skin, it should be removed immediately. Use tweezers to grasp the tick as close to the skin as possible and pull gently. The use of nail polish and Vaseline is discouraged so as to prevent infection. The dog should be treated by a veterinarian in conjunction with the home, preferably on the same day. – Products that contain Amatraz are the most effective. Remove all stored items from floors, under beds, and closets to make treatment accessible. Comforters and sheets should be washed and dried (high heat). Steam clean infant rooms. Pesticide will not be applied here. Remove pet food, water dishes; disconnect and cover fish tanks; remove other pets. Wash, dry-clean, or destroy all pet bedding. People and pets should be out of the house for 4 hours after treatment.